CAMPBELL, CA--(Marketwire - October 14, 2010) - Market research firm Infonetics Research (http://twitter.com/infonetics) released its updated Mobile Backhaul Equipment and Services market size, market share, and forecast report. "Last year Ethernet-based mobile backhaul equipment sales jumped 36% year-over-year, to $4.8 billion, representing 80% of total backhaul spend. We expect Ethernet spending to spike again in 2010 and growth to continue for many years, fueled by the ongoing HSPA/HSPA+ onslaught across the 3GPP world and early LTE deployments led by 3GPP2 players. We see no letup in the Ethernet market: improvements to backhaul solutions, such as packet timing and synchronization, have been made, and about 100 operators around the world are now actively deploying a single IP-Ethernet backhaul to carry all traffic," explains Michael Howard, principal analyst and co-founder of Infonetics Research. Richard Webb, directing analyst for microwave at Infonetics and co-author of the report, adds: "Even with TDM microwave spending declining significantly every year from here on out as service providers move to packet technology, we expect the overall mobile backhaul equipment market to grow to $8.2 billion by 2014 based mainly on the strength of Ethernet equipment." 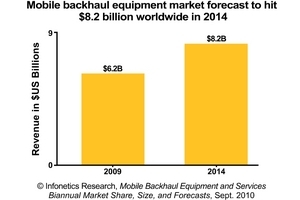 Infonetics' Mobile Backhaul report provides worldwide and regional market size, vendor market share, forecasts through 2014, in-depth analysis, vendor and operator activity, a mobile operator backhaul strategies tracker, and technology roadmaps. The report tracks mobile backhaul equipment by technology and medium (copper, fiber, air); connections by technology and medium (including average bandwidth per connection); installed cell sites by medium and type of RAN (2G, 3G, LTE, WiMAX, mixed), and service charges by technology. Technologies tracked include PDH and ATM over PDH, SONET/SDH and WDM, Ethernet copper and fiber, DSL, PON, coax cable, microwave, TDM, Ethernet, WiMAX, and satellite. A breakdown for IP mobile backhaul equipment (pseudowire-enabled vs. not pseudowire-enabled) is also provided. Companies tracked include Actelis, ADTRAN, ADVA, Alcatel-Lucent, Alvarion, ANDA, BridgeWave, Cambridge, Celtro, Ceragon, Ciena, Cisco, DragonWave, ECI, Ericsson, IPITEK, Hatteras, Huawei, Juniper, MRV, NEC, Nokia Siemens, Overture, RAD Data, Tellabs, ZTE, and others.